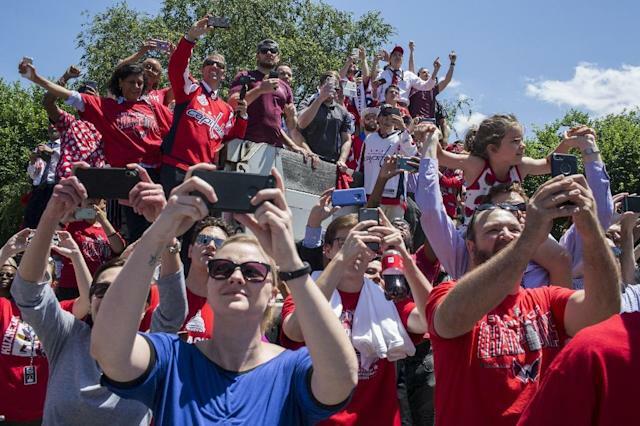 Washington (AFP) - The US capital was a sea of red on Tuesday as tens of thousands of ice hockey fans lined the streets to celebrate the city's first major championship team in 26 years -- the Stanley Cup-winning Washington Capitals. 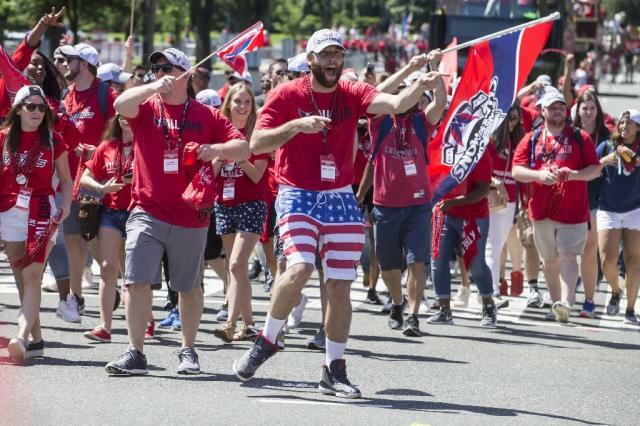 Under sunny skies, the National Hockey League (NHL) champions paraded down Constitution Avenue to rousing cheers of "Let's Go Caps! -- accompanied by marching bands and even a few Zamboni ice resurfacing machines. 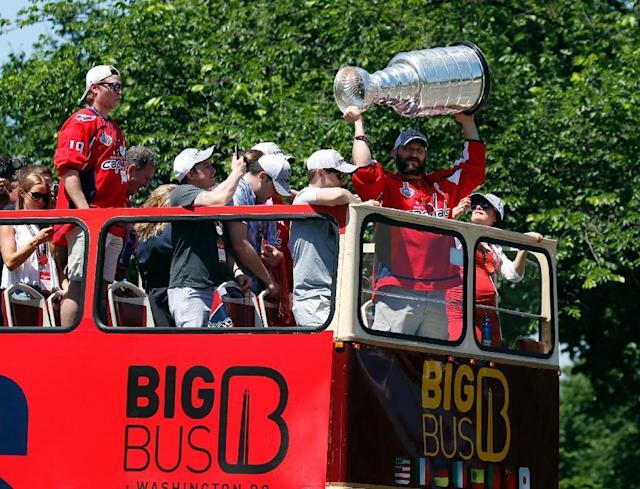 Team captain Alex Ovechkin took a position of honor at the front of the roof of a double-decker bus, repeatedly lifting the glistening silver 35-pound (15.8-kilogram) Stanley Cup into the air. Players tossed beads from the top decks of buses to jubilant fans, many of them dressed in the red jerseys of their favorite players. The number "8" jersey worn by Ovechkin, the Russian-born winger who won the Conn Smythe Trophy as the most valuable player of the playoffs, was by far the most popular. "Ovechkin for President," read one banner on a fire truck. The Capitals secured the Cup last week by defeating the Vegas Golden Knights in the best-of-seven Stanley Cup finals by four games to one. The title is the first in the 44-year history of the Capitals and the first championship won by a major Washington sports team since the Washington Redskins of the National Football League in 1992. "It's incredible," said Caps fan Mark Kulkoskoi, who works in sales and marketing. "We love our hometown teams and we haven't had a championship here in some time. This is a big deal for us." Since their emotional victory, Ovechkin and his teammates have been partying nonstop, lugging the Cup around town and drinking out of it in various bars and restaurants -- with posts on social media chronicling the festivities. Several players were even spotted splashing -- and drinking -- in a public fountain with their shirts off in the upscale Georgetown neighborhood. Tuesday's parade ended at a stage set up on the picturesque National Mall -- with the Capitol building in the background -- emblazoned with huge letters reading "World Champions." The team -- a virtual mini-United Nations featuring players from Australia, Canada, the Czech Republic, Denmark, Finland, Germany, Russia, Sweden and the United States -- was introduced to the crowd one-by-one. Last to take the stage was the indefatigable Ovechkin, lifting the Cup over his head once again to thunderous cheers from the crowd. "Everybody says what happens in Vegas stays in Vegas, but we brought the Cup home!" said bruising Capitals winger Tom Wilson. 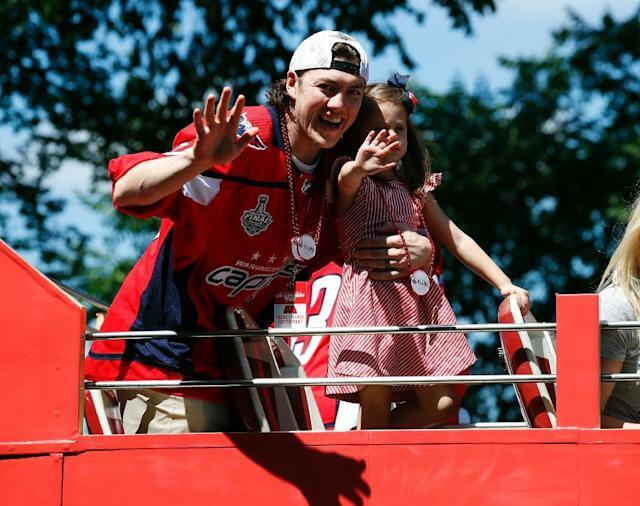 Caps fan Jeff Polhemus attended the parade with his daughter Blake and his son Justin. "I was supposed to be at work today, but..." said Polhemus. "Half the school is empty anyway so I think they know where everybody's at. "I've never experienced any sort of championship of any kind so this has been pretty fun," he said. Another fan, Mike Jeffers, who works in construction, said "it's cool to see everybody so excited, everybody so happy together." "I took the day off for this," said Sherry May, who works as a fundraiser. "I've been a Caps fan for 15 years so it's been a lot of anticipating." The only other time the Capitals made the Stanley Cup finals -- in 1998 -- they were swept by the Detroit Red Wings in four games.